Roy Lichtenstein rose to fame during the 1960s, becoming a Pop Art icon with his images taken from comic books, such as the dynamic 1963 painting Whaam!, based on an image from DC Comics, in the collection of the Tate Modern in London. An important part of his oeuvre was his work in printmaking. He made his first prints in 1948, and beginning in 1962, he made his first Pop Art print. Pop Art, featuring the use of images from advertising and news media, elevated the everyday into the realm of fine art, and Lichtenstein's Interior series embodies these tenets. Lichtenstein's interest in images of interiors arose in the early 1960s, and he saw the subject with an ironic eye in the context of Pop Art. Robert Fitzpatrick wrote that Lichtenstein's images could "also be understood in relation to British Pop artist Richard Hamilton's collage spoofing the ideal modern interiors of the 1950s, Just what is it that makes today's homes so different, so appealing? often regarded as the image that ushered in Pop Art as a major international movement." Hamilton’s collage was a contradictory mix of points of view that included a reverence for the modern and yet acted as a droll parody of it. Lichtenstein often found his images in commercial art, and the images in his Interior series are based on advertisements for furniture, found mostly in the Yellow Pages of telephone directories. Using an opaque projector, he enlarged them, traced them, then extensively reworked them. These images, edited to absolute simplicity, are cool, sophisticated and contemporary, each element carefully placed as if arranged as a still life for an Architectural Digest photo shoot. Fitzpatrick writes: "The interiors were settings in which Lichtenstein's imagination could reinvent the world around him in his particular style and with his brand of humor. 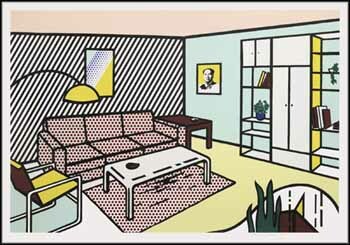 For example, the pristine, ultracool interiors that Lichtenstein painted stood in sharp contrast to the cluttered, lived-in spaces of his studio...Solitary and unlived in, the interiors represent domestic settings in which daily life and private acts can only be imagined." In Modern Room, Lichtenstein uses the visual language he was so well known for - Ben-Day dots, stripes, black outlines and flat fields. In this series, Lichtenstein often included his own works, one of which hangs in Modern Room, next to an image of Mao by Andy Warhol, making reference to Lichtenstein's own place in the art world. The inclusion of these images makes this work even more of a Pop Art icon. The shelving unit, with its geometric perfection and primary colours with black outlines, resembles a work by Piet Mondrian, an artist who interested Lichtenstein so much that he produced works based on his linear grid-like paintings. Modern Room is superbly balanced in all its elements, and its black outlines give the image a bold, graphic quality that packs a visual punch. This work was published by Gemini G.E.L., Los Angeles, in 1991, and is Gemini catalogue raisonné #1504. In a complex process incorporating lithography, woodcut and silkscreen, it was produced in 12 colours in 12 runs, from two aluminum plates, five Baltic birch woodblocks and five screens. With its large-scale, tour de force printmaking methods and striking Pop Art imagery, Lichtenstein's Modern Room is a highly sought-after work from the Interior series. The sheet size of this work is 56 x 81 inches. This work bears a blindstamp, lower right: (copyright symbol, publication date, artist's initials, and Gemini G.E.L. chop).